Nepal Oil Corporation (NOC) (Nepal Aayal Nigam) fulfill their vacancy by open and internal competition on various post and level. 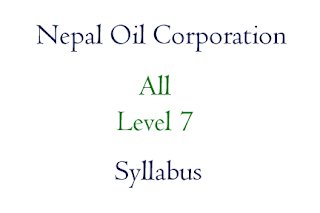 On this post Nepal Oil Corporation Syllabus Level 7, we listed all syllabus of level 7 posts of Nepal Oil Corporation. As listed job posts below choose required syllabus to read online or use download button to download that syllabus of level 7.